I think this is my first purple card ever! Going shopping tomorrow for better paper and brushes and practise more and more! I love the result when it goes well, but I always end up ruining it at the end by making some silly mistake thats ireparable.. 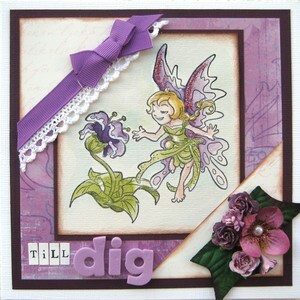 This is after a sketch on the Whiff of joy challenge blog! Beautiful card! I love purple, but rarely use it when I'm crafting! LILA!! Så j***a snyyyyyyyyggt kort! !